For the second time since the turn of the year, the weekend’s Macron East Sussex Football League programme was virtually decimated by the weather. Just five league matches across the league’s six divisions, plus one county cup game, beat the rain on a somewhat soggy Saturday. A Westfield second team player slides in on a Northiam 75 opponent. In the one Premier Division fixture played, Rye Town missed the chance to go second after squandering a two-goal lead to draw 2-2 away to Sidley United. Strikes by Richard ‘Alfie’ Weller and Charlie Stevens put Rye 2-0 up, but goals in the final half-an-hour from Sean Kelly and Arron Scrace earned Sidley a point. Rye are now level on points with second-placed Hollington United, albeit having played three more matches, and five behind leaders Battle Baptists having played one more game. The top two in Division One went head-to-head and honours ended even as Westfield II and Northiam 75 played out a 1-1 draw on an absolute mudbath of a pitch at The Parish Field. Alan Johnson on the ball for Westfield seconds against Northiam 75. Kye Hardiman put Westfield ahead with a tremendous shot from distance soon after half time, but Northiam - who had won all of the three previous meetings between the teams this season - levelled five minutes or so later. Northiam remain 10 points clear at the top of the table, but third-placed Bexhill AAC - who haven’t played in any competition since mid-November - are 12 points behind with five games in hand. Although the result ended Westfield’s run of five successive league victories, it extended their unbeaten run in the league to seven. Elsewhere in the second tier, Mountfield United moved into the top half on the back of a 3-2 success at home to second-bottom Herstmonceux. A Westfield seconds defender and Northiam 75 forward go up for a header. Two Sean Smith goals and one from Jonathan Novis gave Mountfield the points, despite the efforts of Josh Sheldon and Artur Mendes for Herstmonceux. None of the matches in Division Two or Division Three survived and the one game played in Division Four produced a 3-2 victory for West Hill United away to Cranbrook Town. A brace of Matthew Wheeler goals and one by Daniel Wilkes lifted West Hill up two places having started the day second-bottom. Beckley Rangers climbed off the bottom of Division Five by virtue of a 4-1 triumph away to West Hill United II. Westfield second team defender Peter Newstead pokes the ball away from a Northiam 75 opponent. Goals from Luke Townsend, Rhys Piggott, Ole Jurgensen and Joe Maylam earned Beckley only their second league win of the season. Mike Hawley netted West Hill’s consolation. Wadhurst United booked their place in the Sussex Bluefin Junior Challenge Cup quarter-finals with a convincing 6-1 win away to The Lectern. Ryan Bateman, Zak Mckay, Kieran Tincombe, Oliver Vidler, Anthony Allder and Harry Bateman were on target for Division One team Wadhurst, whose reward is a home tie against Whyke United or Furnace Green Rovers in the last eight. 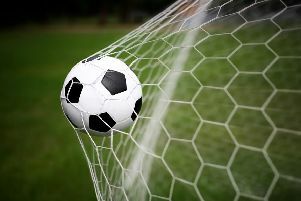 The other three East Sussex League sides still going in the competition, Bexhill AAC, Icklesham Casuals and Sovereign Saints, all had their matches postponed for a second time, meaning they will now lose their home advantage. A full league programme is scheduled for next Saturday, weather permitting, and Battle Baptists will continue their defence of the National Christian Cup with an away third round tie against St Albans Romans in Hertfordshire.